A tiny number of 1895 Morgan Silver Dollar Proof examples is all there is for collectors of today. According to US Mint records, there were 12,000 regular business strikes made of the 1895 Morgan Silver Dollar. If this is true, no one knows what happened to them, because to this day, not one single example is known to exist. Numismatic scholars have long sought conclusive evidence of their fate, but the mystery remains. One line of thought is that the Mint retained all of them until 1918, when 270 million silver dollars were melted under the provisions of the Pittman Act, including the entire mintage of the 1895 business strike dollars. Some have theorized that the 12,000 number indicated on the Mint report were actually 1894 dollars delivered during 1895. Whatever the truth might be, the fact is that the only opportunity for a collector to acquire an 1895 Morgan Dollar lies with the Proof population. Of the 880 Proofs struck, an estimated 600-700 have survived. For many thousands (or is it millions?) of Morgan Dollar collectors, the 1895 stands as a major hurdle in completing a full set. If the day should ever come when a group of 1895 business strikes are found in a long ago forgotten vault, you can still bet the 1895 Morgan Dollar proof edition will maintain its broad appeal. 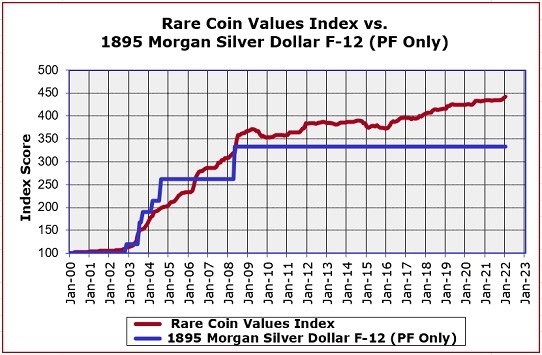 The blue line above charts the percent value increase since Year 2000 of the 1895 Morgan Silver Dollar in F-12 condition (all known 1895 Morgans are proofs, but many of them saw circulation). The red line is the trend of the Rare Coin Values Index, which documents the market activity of a representational group of 87 rare United States coins. The Index uses Year 2000 as its baseline also. The objective of the Index is to get a feel for the performance of the overall rare US coin market. The 1895 Morgan Dollar is one of the 87 coins tracked in the Index, and as you can see, it closely parallels the Index. The individual performance of some of the coins in the Index is much higher than the Index itself, some considerably lower. All Index data is updated monthly.